An extreme weather or seasonal climate event occurs and one question is often asked: to what degree was human-forced global warming the cause? In fact, the National Academy of Sciences just released a report on this subject, also known as climate attribution. In this blog, I will talk about a serious, widely held misconception about extreme events and try to clarify the issue using a new Golden Rule. Let me start by giving you a little quiz. Some area of the world has a record multi-day heat wave. The media and some scientists suggest that anthropogenic (human-caused) climate change contributed. What percent of the extreme temperature is caused by (1) human-enhanced greenhouse gases (GG) or (2) natural variability (NV)? The answer in most cases would probably be (d). The largest contribution to extreme temperatures is from natural variability, which is not the impression one usually gets from the media. Rather, the implication of most stories is that human-caused increases in greenhouse gases, such as CO2, are the overwhelming contributors to extreme weather events. Natural variability causes temperature changes that would have occurred without any human impacts. The more extreme a climate or weather record is, the greater the contribution of natural variability. Or to put it a different way, the larger or more unusual an extreme, the higher proportion of the extreme is due to natural variability. The Golden Rule of Climate Extremes is very different from the implications of many media stories, which suggest that a highly unusual event is mainly the result of anthropogenic global warming. It also has a very important implication. Since the major contributor to extremes is natural, most large climate-related impacts (e.g., heat wave and drought over California last year) would have been occurred with or without human enhancement of greenhouse gases. Now before I get some folks concerned or upset, let me be clear that I am not some kind of global warming denier. Global warming due to greenhouse gas increases IS occurring now. But in virtually all situations its amplitude today is much smaller than natural variability. THAT'S the point. It is easy to demonstrate the GOLDEN RULE OF CLIMATE EXTREMES. Here is the IPCC global temperature future projections assuming a large increase of greenhouse gases (A2 scenario). About a 1C warm up so far globally. Of course, the warming is not uniform, with the Arctic warming up the most and continents warming more than oceanic regions. This is illustrated in the projected change between 1980-1999 and 2020-2029 from the IPCC report. The Arctic is forecast to warm by 2-3C. Now consider the heat wave of winter 2015. 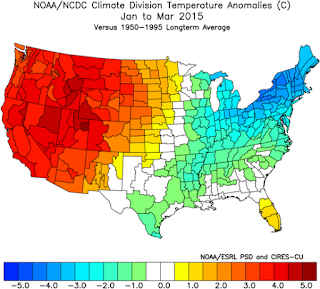 Here is the difference from normal (1990-1995) for January-May (the temperature anomaly). Huge warmth in the western U.S., with anomalies reaching 4-5C. The global warming signal is much less (perhaps 1-1.5C). So most of the warmth must be from natural variability. And we even know what natural variability that did the deed: unusual ridging (high pressure) over the western U.S. and the eastern Pacific. The record breaking precipitation this last winter over the Pacific Northwest? Global warming suggests only a very minor increase in winter precipitation, completely dwarfed by the huge wet anomaly this winter. Natural variability rules, at least for now. Another way to understand the Golden Rule of Climate Extremes is to look at probability plots of temperatures. Here is an example from the IPCC Science report. Temperature probability plots tend to be Gaussian (bell-shaped), with the highest probability near the mean. 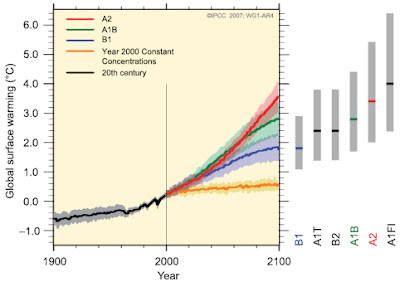 The gray line shows the situation before any anthropogenic warming. The probabilities decrease towards warm and cold extremes, with this distribution caused by natural variability. If the mean warms, the whole distribution tends to shift towards warmer temperature (dashed line). The probability of extremes increases, but the reason they are much warmer than the new mean is STILL because of natural variability. Even if there was no global warming, the extreme temperatures far to the right of the mean would STILL be extreme. Let me put it a different way. If there was no natural variability, NO ONE would be talking about heat waves or precipitation extremes. If temperatures, were always the same and warmed up by a 1-2C, few would notice. Our temperatures typically reach around 44F in midwinter. If they rose to a steady 47F, would you even notice? A frequent analogy for anthropogenic climate change is that it is like putting the climate system on steroids. But think about this comparison for a second. Steroids incrementally improve the performance of world-class athletes. They are already 90% of the way there and they are looking for a small additional edge (which is huge when you are playing at their level). You don't give steroids to the average person and expect they will be breaking world records. Similarly, without natural variability doing most of the work, you don't get extreme weather. Now some folks might ask: couldn't global warming cause some kind of climate discontinuities, whereby the modest radiative effect from CO2 causes a jump in temperatures or a radical reorganization of the atmosphere. 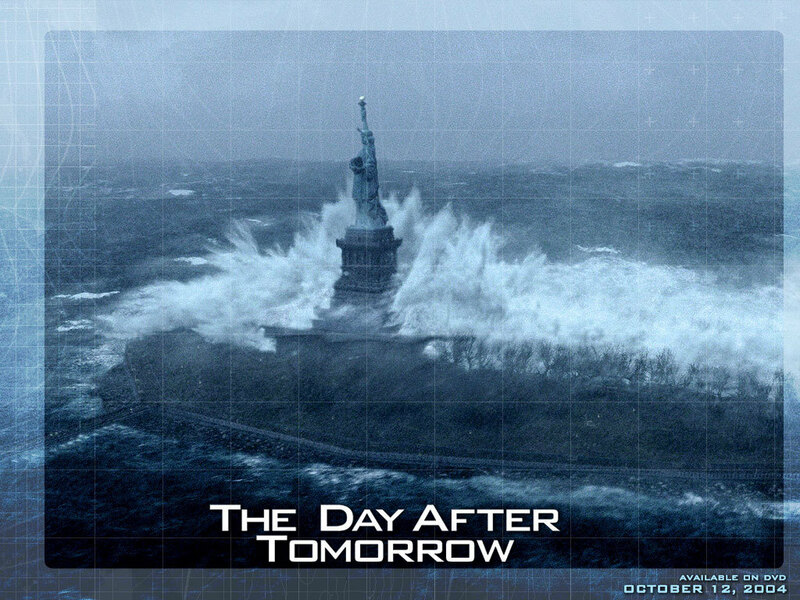 Such a hypothesis was the basis for the movie, A Day After Tomorrow. For most of the planet, this does not seem to be the case. Our best models do NOT suggest it. In fact, there is substantial research that suggests that variability in the atmosphere could deamplify as the planet warms. As the Earth warms, the global warming signal will increase progressively and eventually will produce temperature anomalies in some location as large as those produced by natural variability today. But these is not the case now and won't be for a long time (end of century). So remember the GOLDEN RULE OF CLIMATE EXTREMES and hopefully some of the media will keep it in mind. 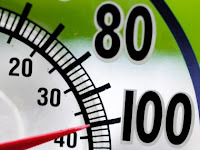 Several folks have noted that global warming will increase the frequency of extremes. That is absolutely true. But nevertheless most of the origin of the extremes will still be from natural variability. Consider a population of people in which the heights range natural from 60 to 79 inches. So there is a natural variation of heights from 5 feet to 6 ft 5 inches. Now a new vitamin/protein supplement is discovered that increases the heights of people by 1 inches. There will now be new record heights (6 ft 6 inches). A big increase in frequency for such heights. But most of the variability (now from 61 to 80 inches) will still be natural. Climate is the same way. As a percentage of the change in temperature, it does make sense that climate change makes a smaller contribution to extreme weather events than natural variability does. But just eyeballing that temperature probability distribution, it looks like with the shifted distribution, you would expect 2x more "hot" events/days, and ~5x more "extreme hot" events/days. That sort of increase in the number of events isn't ~10%, it's 200%-500%, and it's also the sort of change that's much more noticeable - "gee, this seems to be happening more often now." Or am I thinking about this incorrectly? The question of "how much of this extreme is due to global warming" is ill-defined. We are talking about a proportion of what quantity? Your interpretation of the quantity as [deviation from long-term mean (no warming)]/[deviation from mean] is one reasonable way of looking at it. 1 - [p-value of event under long-term historical normal distribution] / [p-value under GG-mean-shifted normal], and then you could easily get numbers close to "caused 100% by GG". As much as I agree with your criticism of the media, I actually like the latter better, from a statistical perspective on causation. Of course the distribution is not exactly normal, and probably has heavy tails, which makes the latter number volatile and hard to estimate. Could you blog one day on the question of heteroscedasticity of the climate series - is climate change changing the scale and shape of the distribution, and not just the location? The reason for denial of AGW is mostly a political issue. People in a society don't choose to accept something because of the degree that it is "hyped" or not. They choose to accept it because of evidence and what experts that study the subject produce as evidence. If you not accept something in science because it was "hyped" in the newspaper, then you never bothered to understand it with scientific evidence in the first place. There is always going to be a reason to not accept AGW, the media hyping it might look bad to a scientist, but the answer is to have more people wiling to accept science, or another way to say it is to educate people to be more scientifically literate. Media hype is not the underlying cause for climate change denial. The problem is that so many people are unable to or unwilling to actually accept what the science says. It doesn't matter how convincing the science is, you can always go to the level of , "oh I don't trust scientists, they have been wrong before." I have never seen any academic discussion of this. Are there any? Cliff, you seem to be taking a much more sanguine view of recent climate changes than other climate experts I read. "The Nasa data shows the average global surface temperature in February  was 1.35C warmer than the average temperature for the month between 1951-1980, a far bigger margin than ever seen before. The previous record, set just one month earlier in January, was 1.15C above the long-term average for that month. ... A major El Niño event, the biggest since 1998, is boosting global temperatures, but scientists are agreed that global warming driven by humanity’s greenhouse gas emissions is by far the largest factor in the astonishing run of temperature records. ... The record for an annual increase of atmospheric concentrations of carbon dioxide, the main greenhouse gas, was also demolished in 2015." Jeff Masters and Bob Henson of the Weather Underground said "This result is a true shocker, and yet another reminder of the incessant long-term rise in global temperature resulting from human-produced greenhouse gases ... We are now hurtling at a frightening pace toward the globally agreed maximum of 2C warming over pre-industrial levels." Professor Stefan Rahmstorf of Potsdam Institute of Climate Impact Research said "We are in a kind of climate emergency now ... This is really quite stunning ... it’s completely unprecedented." Do you really believe that the marked increase in ocean heat content, the marked rise in sea-level, the world-wide melting of glaciers, the record-setting decrease in minimum Arctic sea ice extent, the melting of the permafrost in Alaska ... all represent mostly natural variation, rather that profound effects of man-made global warming? 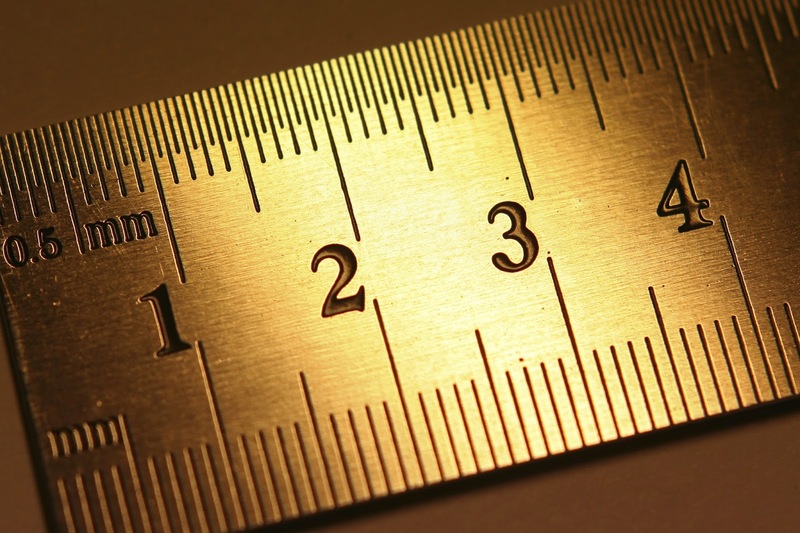 Has your "Golden Rule of Climate Extremes" been vetted by other climate scientists? Can you show me a link? Can we really just ask the media to attribute more climate changes to natural variation, rather than implore humanity to make an all-out effort to slow global warming? 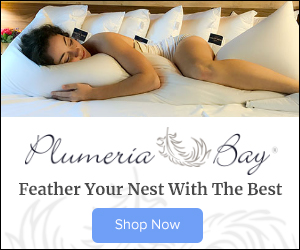 How can I explain this site to my friends to myself? Do I tell them the site is false, fake and a lie? They say 2015 wasn't warm. I had understood that climate change not only increases the average annual temperature (an issue you address in your post) but that it also increases the likelihood of extreme weather events (hotter hots, colder colds, snowier and windier blizzards, etc.) In a quick Google search, I see that I'm not the only one with that understanding. See, for example, this quote from the Federal EPA website: "Extreme weather is typically rare. But climate change is increasing the odds of more extreme weather events taking place." Is this not correct? Are extreme weather events no more likely with climate change than without? To think that by the end of the century that the global warming signal will be as large as the natural variability signal, is truly terrifying. I think people need to be careful, that even though this post highlights the relative contribution of NV to Global Warming, to realize that acting on pollution reduction with the utmost aggressiveness is STILL critical. We can't slack on the issue for second! Those of us who grew up in the Pacific Northwest are used to having deep snow in the mountains during the winters...The fact that future generations likely won't have this, is heartbreaking. Its also important to note, that the end of the century, contrary to what Cliff says, is not actually that far off. From a geologic perspective, these changes are happening at warp speeds. I don't consider "the end of the century" to be a very long time. ...which would have been in 2005. ...somehow they seem to skipped over both Ike and Gustav in 2008. Ike: 112 deaths in the US, hit Florida and Texas, winds reached 143 mph. (and my hurricane chart placemat recently purchased in Florida). For surface temperature records i'd visit NASA's GISS or the UK's records. If you want a private non-governmental source, http://berkeleyearth.org is a good one. All data they're using and their methods and programs are available for study and critique. It's been a while since I've read an IPCC report, but this prompted me to fetch the WG1 AR5 document. 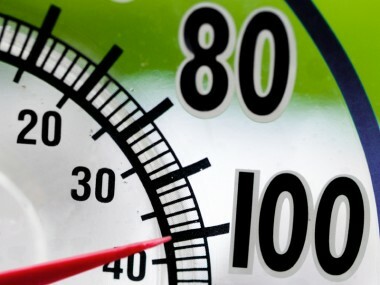 I was under the impression that previous reports suggested more extremes, not just more high temperature extremes, which would seem to suggest a widening of the standard deviation. The statement that atmospheric variability might reduce seems to contradict that somewhat. I'm hoping to find what the report actual provides as supporting evidence for one or the other. What I had understood from previous IPCC reports was an increase in the average AND an increase in the standard deviation. What I'm hearing herein is an increase in the average and possible decrease in stddev (or at least, no expected significant increase). I don't hear much doubt regarding the increase in average, but what's the actual story with the standard deviation? We'll leave the skew for another day. Thank you for more about this maxim. You have mentioned it before and this explanation makes the concept more clear. Statistics and probability are challenging and often not easy to understand intuitively. As another person has asked above, I would like more clarification of this maxim in relation to the fact that 2014 and 2015 were succeeding back to back new records for average global temperature. Does your golden rule apply to this process of variation too? Is this also more likely to have been natural variability because it is an extreme of the range of possibilities? They argue that accumulating fresh water from ice melt of Greenland and Antarctica ice sheets is slowing normal ocean circulation. This process is occurring faster than previously predicted and will lead to even stronger superstorms (e.g. 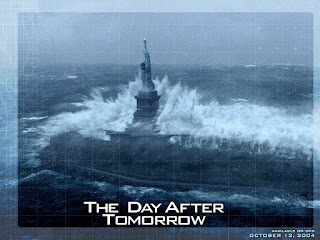 Sandy) and to faster sea level rise (e.g. 1 meter in 50 years and 2 meters in 60 years). Dr. Hansen has an accompanying video to explain the paper to a lay audience. I suspect a refresher course in probability would help. First, the assumption that weather variability (whatever we actually mean by that) follows a Gaussian distribution is not a fact, but something that should be proved: things are Gaussian if they are the result of many small independent (or very weakly dependent) contributions. It's far from obvious that this would apply to weather (and it turned out to be a disastrous assumption when it was used to model home prices in the 2000s). Second, even if it was Gaussian, where does your estimate of the variance come? And how do you know that human related warming hasn't affected it? Determining the probability distribution of a moving chaotic target like the climate is non trivial, and it looks like the Gaussian curves you draw are just made up. Finally, you are playing with words. As you mention, even if "variability" (that is variance) has not changed (again: how do you know? It looks like a difficult statistical problem), shifting the mean, even by little, will greatly increase the occurrence of extreme events, so the increase would be due to human generated warming, and that's what people are worried about - they couldn't care less that "the variance wasn't affected" - that's a questionable technical assumption that as zero relevance to the debate about whether human caused warming is producing more extreme events, which is the real issue. Sense the Weather Channel has been naming winter storms,over the last few years. Would it be GREAT if they started naming heat waves,and droughts,after baseball players ? The S.W.CONUS Heat Wave/Drought; McGwire? or the Caribbean Drought; Sosa? The largest contribution to deaths from driving (extreme event) comes from driving in the first place. True, but is this useful to assess the the impact of speed limits and other traffic safety measures? A probability based estimate seems a lot more useful to me. I'm just eyeballing your "shifted mean" graph here, but a 4x or 5x increase in extreme events is non-trivial if that extreme event happens to be a 100 year flood. It would mean an immediate change in how we currently manage and zone for flooding. Cliff - how is it decided if an event is extreme? How would you define it? The first figure's error bars increases which implies that the variance is increasing. Your assumption of mean-shifted Gaussians with constant variance may be flawed. Someone should run non-parametic bootstrap statistical analyses for variances in time and geographic blocks. If there is a correlation between the median and mean temperature changes and the changes in variances, it could quantify the variability effect without assuming a particular statistical distribution. The assumption of normal (Gaussian) distribution is often based upon fitting to non-normal histograms. 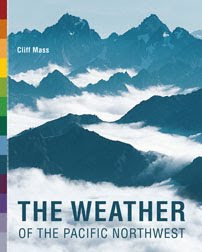 Chris, would you not agree that climate is a complex system (complexity sensu stricto) and that seemingly small changes change perturb the system from one of modest equilibrium to a chaotic state? The positive feedback nature of temperature rise viz icecaps and ocean circulation, while natural, is largely influenced by anthropogenic greenhouse gases. Extreme weather may be the course of things until a new state of relative equilibrium is obtained. It would be interesting to have your take on the Hansen paper after you've had a chance to digest it. It doesn't contradict what you're saying here, but would a rational person, having Hansen's work as of today with all the evidence and uncertainty, purchase a house in, say, St. Augustine? Would a rational civil engineer design a bridge there, when current design standards are geared toward a 100-year design life? Agreed that it would be interesting to hear Cliff's analysis on Hansen paper. While Hansen's paper has been peer reviewed, we don't yet know how much weight IPCC will give this admittedly extreme case, and how that will shift the consensus model. This is where science gets to be a lot of fun to watch from the outside. Consider a population of bike athletes who compete in the Tour de France. There is natural variability in the maximum amount of oxygen that these athletes can utilize during the race, causing some of the athletes to perform better than others. Now consider that one of the athletes -- say Lance Armstrong -- starts using a performance enhancing drug (EPO) that slightly increases oxygen utilization, and wins the Tour de France 7 times. According to Cliff's argument, the victories can mostly be attributed to natural variability and Lance should be held blameless. Clearly Cliff should consider quitting the weather business and enter the much more lucrative field of defending tarnished athletes. I believe that the problem here is that the attribution question is subtle and is subject to two (or perhaps more) possible interpretations: were one or more events caused by climate change or did the likelihood of one or more events increase due to climate change? The problem here is that you only address one of these questions, so the results you arrive at are skewed by this bias. I believe this results in a misleading interpretation. How does James Hansen's global temperature predictions from 1988 compare to the observed and the climate skeptic Lindzen. Global temp anomaly for 2015 was 0.87C NASA, 0.90C NOAA. Way back in 1988, Hansen's model correctly predicted global temperature to reach about +0.9C by 2015 and 1.0C by 2018. Way back in 1989 Lindzen predicted no change. Hansen's global temperature prediction's have been accurate for 27 years. Hansen's warnings should be taken seriously, because he has been right. Should we be concerned that the global temperature anomaly rose to 1.35C NASA, 1.21C NOAA for February 2016? Duh. Seems to me not a good idea to always expect small changes in the weather to accompany minor temperature changes. After all, within only a fraction of a degree water will change from a solid to a liquid phase, offering potential huge changes in weather patterns. I agree with singliar's comment that your definitions of GG and NV aren't the most intuitive ones. It seem to me that when discussing an extreme event, we should really be thinking about how the existence of that event updates our probabilities for global warming in a Bayesian sense. For instance, say that the long term temperature average is roughly Gaussian with a standard deviation of 2 C (or whatever the real number). That would mean that there is a 2% chance of at least +4 C anomaly. Whereas if global warming is true and the mean has actually shifted by +1 C (even ignoring the increase in variation expected), then you expect the chance of a +4 C heat wave to go up to 6%. Thus, every such anomaly we observe increases out posterior probability that global warming is occurring. I think it's this idea that 'heat waves occur more often in worlds with global warming than in worlds without it' that makes single extreme events worth reporting on.